I’m fascinated by words, maybe beyond fascinated: I like how they look on a ‘page’ and how they form a coherent picture when they combine. But, more to the point, I love how they take shape in my mind and how they feel, coming out of my mouth (this may have contributed to my need to share my words with everyone). I guess you could say that is why I write. Even more than this basic emotional response, I am also driven by a rational deconsruction of the words that I present and those that are presented to me. 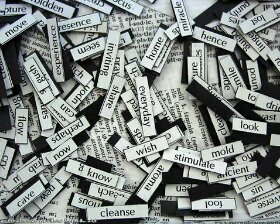 Mostly, I favour the efficiency of words, meaning that my preference is to use the smallest most common word that represents the concept I am thinking of. This began when I turned against the idea that a larger vocabulary suggests more knowledge: to be more precise it was in opposition to those who think that big words and/or words that went unused by the ‘commoners’ show that the person knows what they’re talking about.